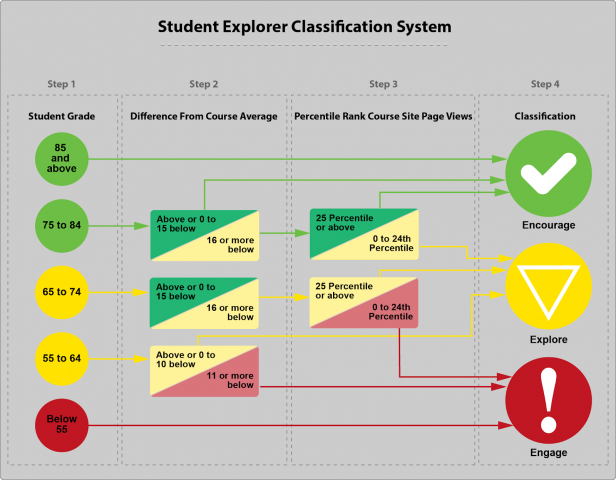 Student Explorer is a tool developed by Academic Innovation and maintained by the Information Technology Services Teaching & Learning group. Academic Advisors, Coaches, and Mentors use the tool to view a high level overview of Student activity, pulled from the Canvas Learning Management System. This information guides Academic Advisors, Coaches, and Mentors in interactions with their Students. In Student Explorer, Students can be sorted into cohorts by request. 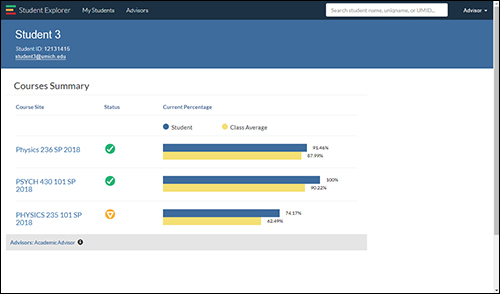 The grade information that Academic Advisors, Coaches, and Mentors can view is the same information a Student can see in their Canvas Student View. Students do not have access to Student Explorer. Academic Advisors, Coaches, and Mentors will not see cohorts unless they belong to one. To request access to Student Explorer, please contact the Student Explorer team. Access is granted to staff and some faculty who are engaged in academic advisory, coaching, and/or mentorship capacities with students. To request a cohort, please contact the Student Explorer team. In the message, include student uniqnames and the desired cohort name. Please send the request as an Excel or Google Sheet with the student names listed with commas separating each name. The Student Explorer Dashboard shows Academic Advisors, Coaches, and Mentors a snapshot of their Students, Student Cohorts, and Student Status. Each student is linked to a more in depth view of their status. Note:Academic Advisors, Coaches, and Mentors who do not have cohorts established will not see this information. See "Requesting a Cohort" above for information about how to set up a cohort. 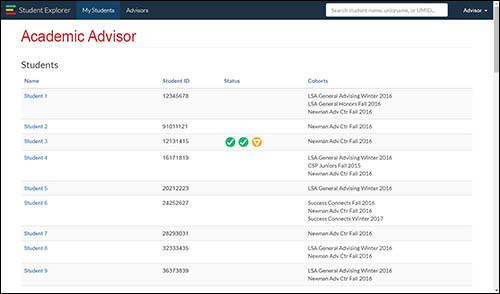 Student Explorer has a color coded system for Academic Advisors, Coaches, and Mentors to see action they may need to take at a glance. 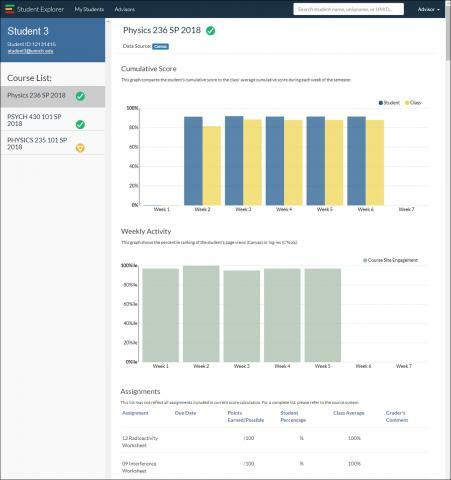 The system is based on Student grades as reported from Canvas. A rank of 25th percentile or above for page views within the course. A Student with a green icon should be encouraged to continue using the strategies to maintain a high grade. A grade of 75% to 84% and a rank below 25th percentile for page views within the course. A grade of 65% to 74% and a rank of 25th percentile or above for page views within the course. A Student with a yellow icon requires some exploration into why their grade is in the mid range. A grade of 65% to 74% and a percentile rank of 0 - 24th percentile below the class average of page views within the course. A Student with a red icon should be engaged to discover what could be contributing to the lower grade percentage. A student with a gray icon does not have grades available in the Canvas gradebook. Academic Advisors, Coaches, and Mentors can click on an individual Student name to see a more detailed activity report. The students grade is compared with the class average in a bar graph, with the classes and status icon to the left. At the bottom, all the Academic Advisors, Coaches, and Mentors working with the student are listed. Cumulative Score - Contains a graph that compares the students cumulative score to the class average. Weekly Activity - Contains a graph which shows the percentile ranking of the student’s page views in Canvas or CTools. Assignments - Contains a listing of all the assignments the student has completed that have been logged in Canvas by the Instructor. For any questions, concerns, or requests related to Student Explorer, please contact the Student Explorer team at student-explorer-help@umich.edu.